Keep in mind that this is an IC wiki page. Born on the border of T'Nanshi and what was at the time M'Chek, Dru was the child of an injured M'Chekian Human soldier and an Elven healer. War being what it is, the soldier returned to his duties and was never heard from again. Dru's mother wandered the battle areas with her child, healing many and constantly looking for the man she loved. As time grew so did awareness of the healer that would treat anyone of any race. As is often the case during times like those, Dru's mother met with hatred and derision from both Elves and Humans for her actions - and ultimately was killed by a group of villagers for being a traitor. Dru was taken to be fostered by a village family. As she grew, she began to realize that those assigned to protect do not always have a child's interest in their hearts. She was shunned from one foster family to another, endured a myriad of beatings and worse, and learned to find her solace in the forest. She came to feel that the creatures and trees were her only real family. 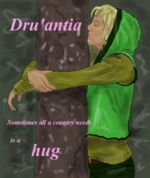 Finally running away for the last time at the age of 15, Dru wandered the forest learning from the Dryads and starting her calling as a Druid. At the age of 19, a urge to know more of people led her to the gates of Elysia. She was extreamly shy, very untrusting and yet because of her past abuse, eager to please and get approval. The struggle to fit in to town life sent her frequently to the Temple of Dru'El where she felt most at home. She soon made the decision to become a follower of the Creator of Elves and honor him by caring for his forest and creatures. It was during this time that she met the two people who would change her life - Davillia Chert and El'gos Longstride, who was to become her partner in life. This page was last edited on 24 September 2009, at 15:39.